To spend 48 hours in Bangkok would be like picking up a book and only looking at the cover. This city, home to around 11 million people, is chaotic and overwhelming, to say the least. But the more time you spend here, the more you are going to fall in love with it. 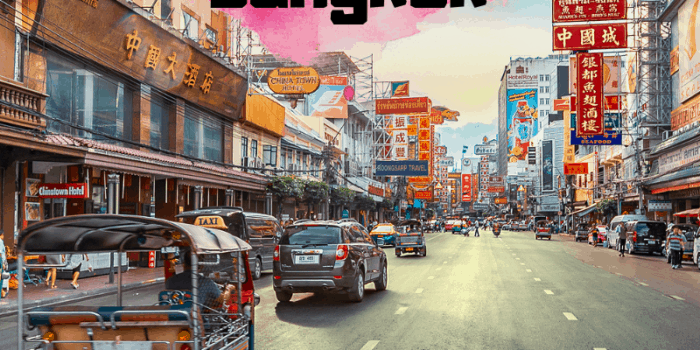 A tourist map isn’t enough to make you feel confident to explore the nooks and crannies of one of Asia’s largest cities, so I’ve put together a bunch of tips for Bangkok travel – from travelling on a budget to knowing what Thai street foods to try. Give this city the time it deserves and I guarantee you will be left speechless by the time you leave. 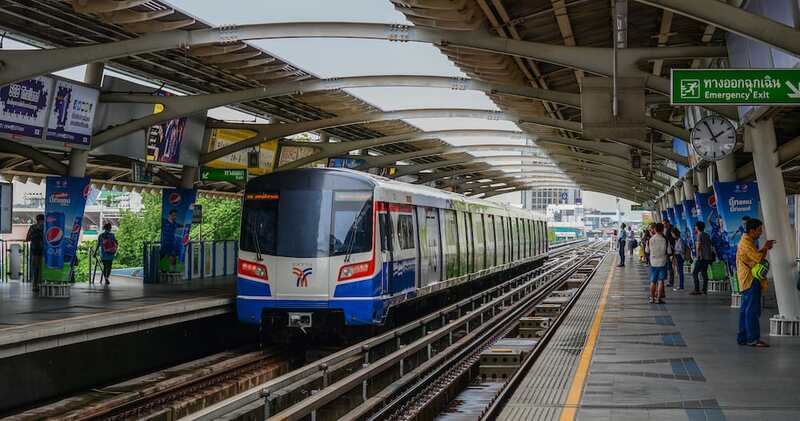 The cheapest way to get from Suvarnabhumi Airport to downtown Bangkok is to take the Airport Rail Link, which costs between 15 and 45 baht depending on where you plan to get off the train. You will find a bunch of different signs for this option upon your arrival at the airport. The train will drop you off at the Makkasan Station downtown and only takes about 15 minutes. Once you have arrived at Makkasan Station, you will be able to connect to the BTS Skytrain. Because you are able to avoid the notorious Bangkok traffic, this train is arguably the quickest way to arrive downtown. Of course, you can take a taxi as well. There are certified taxi stands inside the airport. 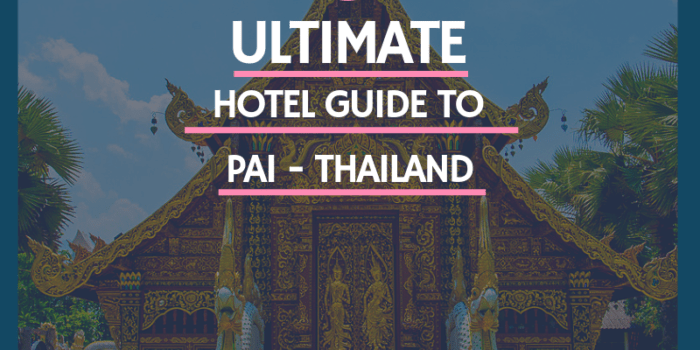 You can expect to pay between 500 and 1000 baht to arrive from the airport to your hotel. Remember to write down the address or take a screenshot of its location on a map before arriving! Oftentimes the internet isn’t working, and you don’t want to be stranded at the airport trying to figure out where you need to go. What should you expect to spend per day? 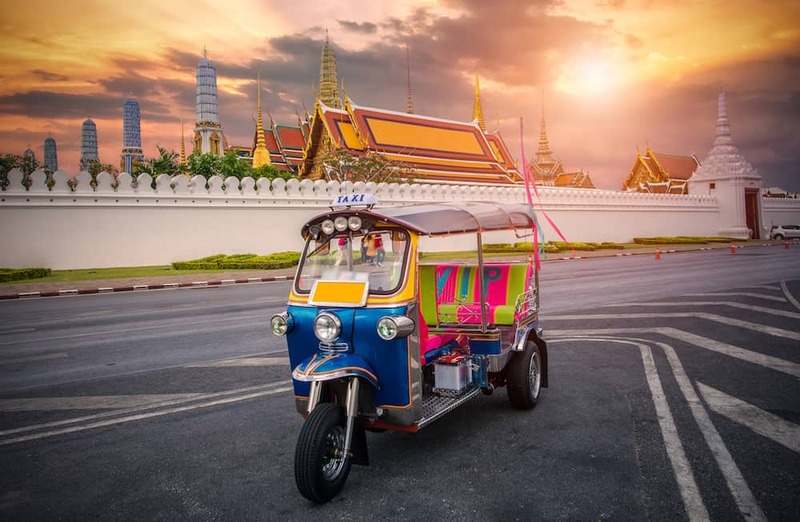 Thailand has arguably become the most popular destination in the world for budget travelers, and travelling in Bangkok on a budget is quite easy to do. Most people are able to get by on 1,000 to 2,000 baht per day. 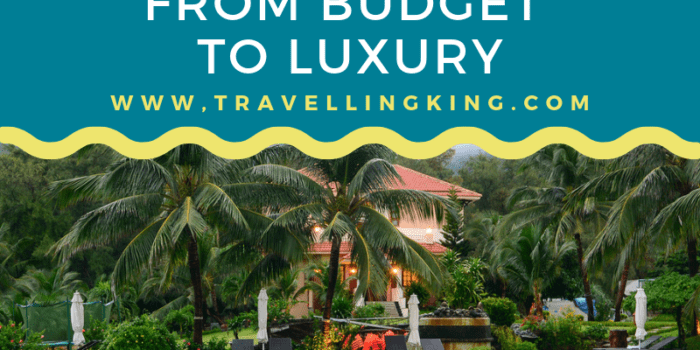 Obviously, you will spend more if you prefer luxury accommodations over budget hostels or fine restaurants over street food stands. The nice thing about Bangkok is that it caters to all budgets. Most of the traditional tourist attractions in the city charge an entry fee, so if you are planning to see a ton of different sites, you will want to budget accordingly. Make to check your country’s conversion rate upon arriving. 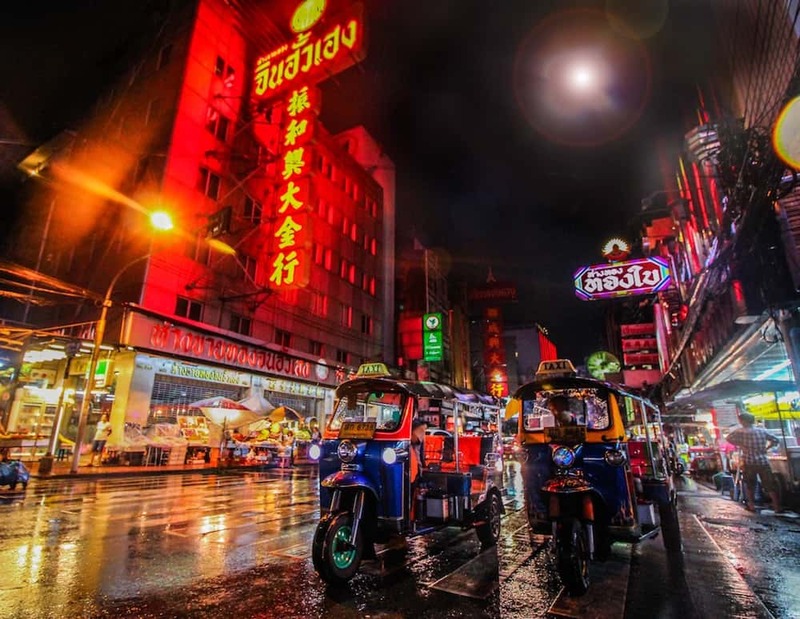 Travelers have many transportation options in Bangkok: taxis (both cars and motorcycles), tuk-tuks, and songthaews will take you directly to where you need to be. Download maps.me or another offline map location to ensure that you will arrive at your destination. Another (cheaper) way to navigate Bangkok is to take public transportation. There are plenty of options, including the BTS Skytrain, the MRT Subway, or the bus. The Skytrain is what I recommend most because you will get a great view of the city no matter where you are. It’s also convenient because you can buy tickets at the station. Normally, there are English-speaking employees willing to assist you if you are confused. The MRT is fairly new and another great way to get around the city. I recommend that everyone use the google maps public transportation feature as it has saved me time and money. Finally, the Chao Phraya River has boats to take tourists and locals alike from point A to point B. This is not only an efficient method of transportation, but it’s also a great way to see the city from a different angle. Travelling in Bangkok is great for wanderers. You can spend hours walking down different alleys, mesmerized by the rich character of its buildings and people. 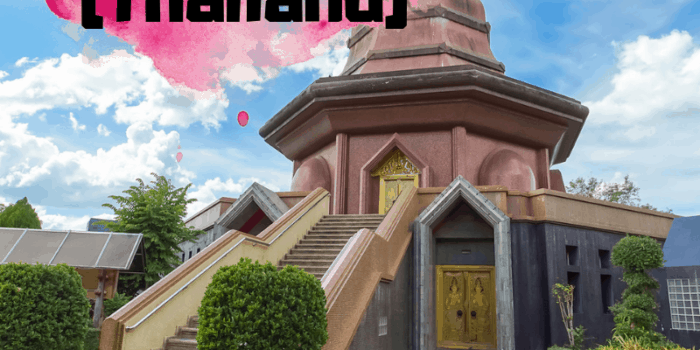 There are so many different neighbourhoods to visit, but two of the most popular ones with tourists are Banglamphu and Ari. Located in Banglamphu is the place that everyone has recommended you see: Khao San Road. 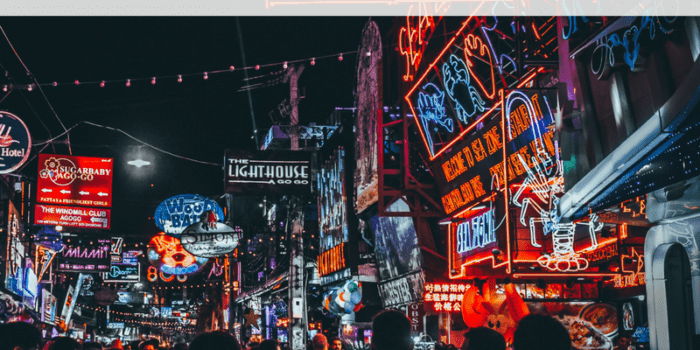 Khao San Road is the heart of Bangkok’s backpacking culture. If you want to meet other travelers, be sure to stay at one of the neighbourhood’s many hostels. The streets are filled with vendors selling artisanry, food, used books, and fake accessories. Khao San Road is also a great place to find tours of the city or other popular Thai tourist destinations. At night, Khao San Road really comes alive. If people watching is your thing, you will never get bored here. Trust me. Once you’ve had enough of the Khao San Road chaos, be sure to wander around the neighborhood. You can even check out Wat Saket or Wat Suthat, two Buddhist temples. Ari is where all the hipsters hangout in Thailand. It has a much calmer vibe than other areas of the city, making it a great place to spend the afternoon wandering around. As I said, Bangkok is massive and overwhelming! However, spending time in Ari will make you think, “Hmm, I could probably live in this city.” Be sure to check out one of its many coffee shops. This place is a great way to spend a morning in Bangkok. If you’re wondering where to eat in Bangkok, you can’t go wrong by heading to one of the city’s many markets. These places are another great way to spend the morning or afternoon. Chances are you will see a handful of things you never have before. 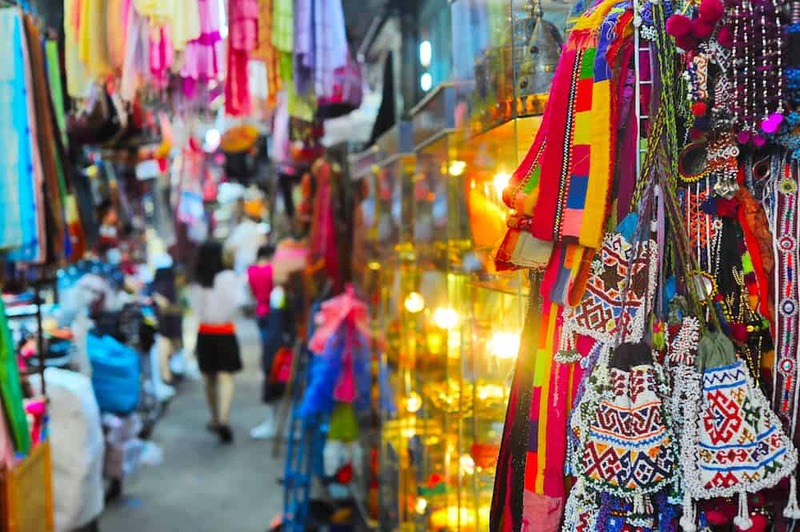 The first market I recommend visiting is the Chatuchak weekend market. 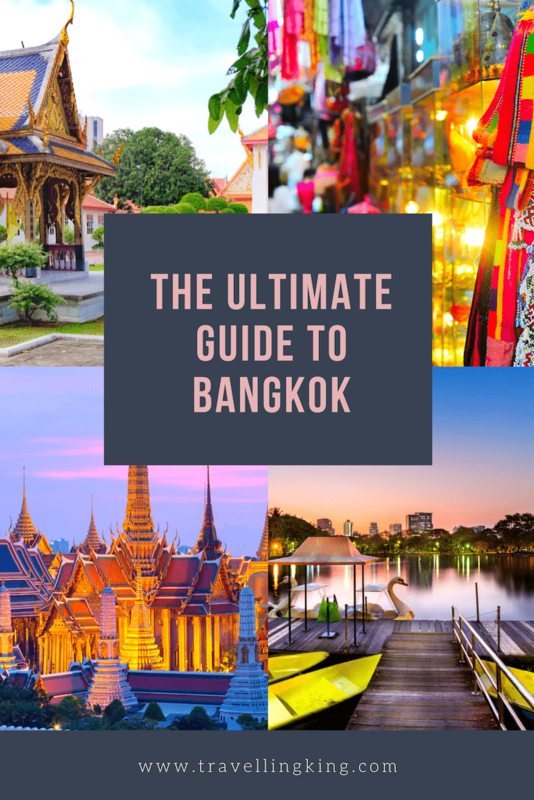 It’s Bangkok’s biggest and covers more than an entire square kilometer. There are a bunch of maps online that will help you find the exact section you are looking for – pick a direction and start walking! You can find anything you need here, and if Bangkok is the final stop on your trip, I recommend getting some souvenirs. You won’t find a better place elsewhere! Chatuchak is a great place to shop, but Wang Lang Market is the one that I recommend most for all you foodies out there. Due to its location on the east side of the Chao Phraya River, you won’t find as many tourists here. However, it’s a great place to take one of the boats that I mentioned earlier. 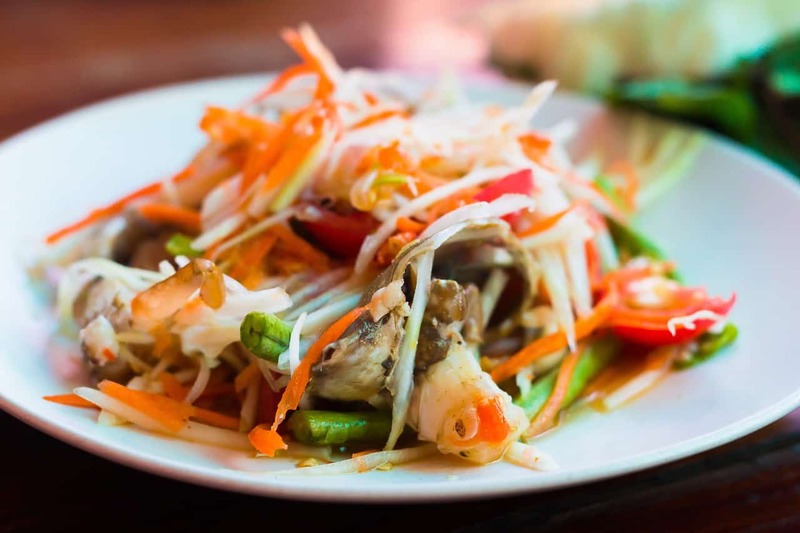 At Wang Lang, you can really find any sort of Thai food you’re looking for. There are grills scattered all over the place serving fresh meat, little stalls selling noodle dishes you’ve never heard of, and plenty of dessert stands to finish off your visit. The last market that I would recommend visiting is the Or Kor Tor market. If you’re on a budget, come here to snag some fresh fruits and vegetables. This market is cleaner and more organized than the others. People ask me all the time, “What should I eat in Thailand?” This question is so difficult for me to answer and I usually will just rant for a while talking about all of the different things that I’ve tried but can’t remember the name of. There are a few things that I can highly recommend though. First and foremost is the dish that you may have tried in your own city’s hipster neighborhood: Pad Thai. Pad Thai is a stir-fried noodle dish that is the most common Thai dish. There are SO many different ways to make the dish, and each little stand is bound to be different from the next. Be careful with the spice at first! Guay Teow is another one of Bangkok’s most popular dishes. What makes Guay Teow different from Pad Thai is the fact that it is a soup instead of a stir-fry. It’s typically served with meat, which gives the broth its flavor. Again, this dish is going to be very different from stall to stall. My favourite soup, though, is Thom Kah Gai. It’s a creamy soup made with coconut milk and hot chilis. Sounds spicy, huh? Actually, it’s pretty sweet! And speaking of sweet things to try, mango sticky rice is my favorite way to end a meal. Recommending Thai foods is really difficult. I can’t tell you the number of times I’ve just pointed at something random on the menu and been amazed by the meal in front of me. Step out of your comfort zone in Bangkok! You’ll shortly see why it’s revered as the street food capital of the world. The best place to visit for tourists in Bangkok is the Old Town. It’s here where you will find most of the tourist attractions recommended by your guidebook. The Grand Palace is the city’s most popular landmark. It was once the home of the Thai king but is now open to the public. There are also a handful of different temples worth visiting, such as Wat Phra Kaew, Wat Arun, Wat Pho, Loha Prasat, and Wat Saket. 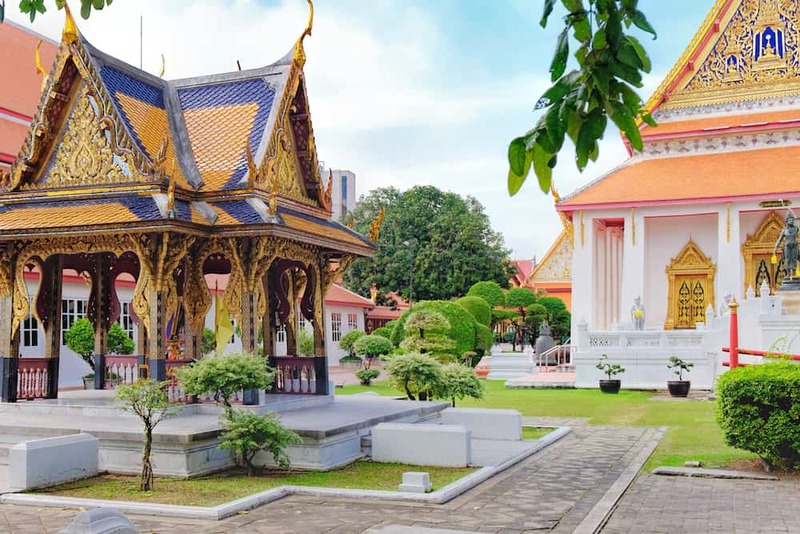 The Bangkok National Museum is very near to the Grand Palace and exhibits all sorts of different relics from different periods of Thai history. The Museum of Siam is another museum in the Old Town. 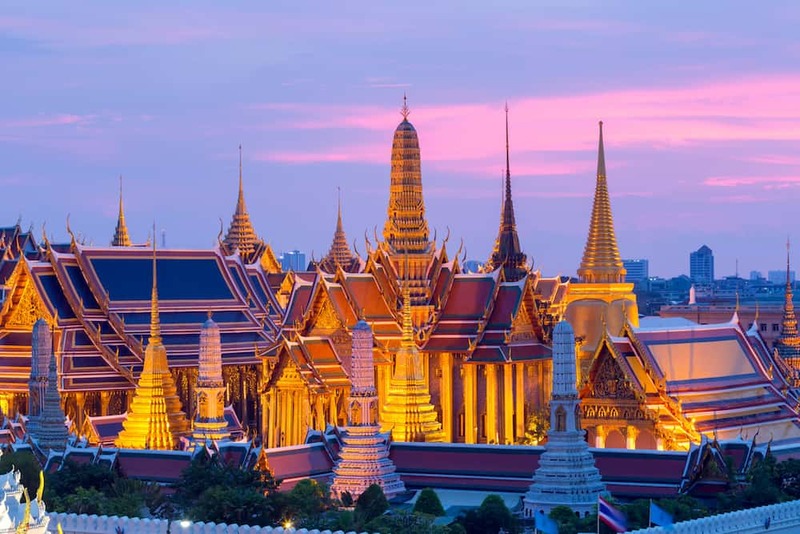 There is a never-ending list of things to do in Bangkok, and there are so many different museums to visit in order to learn more about Thailand. One of the most popular museums is the Jim Thompson house. Yes, you read that correctly. Jim Thompson was an American expat who lived in Thailand for a number of years. When he passed away in the late 1940s, his private collection of Asian art was turned into a museum. It’s a really great way to spend an afternoon in Bangkok. Another great art museum is the Museum of Contemporary Art (MOCA), but my favorite is Art in Paradise. This museum has three-dimensional art that you can become a part of. Come prepared to strike a pose and you will have a bunch of hilarious photos to share with your friends back home. If you’ve seen the Hangover, you know that Bangkok is notorious for its nightlife scene. Bangkok is an incredible place to explore by day, but at night the city comes alive in a way that others don’t. If it weren’t dark outside, you would think that you were strolling around mid-afternoon due to the number of street vendors and other stalls outside. For a great night out, there are three different areas that I recommend: Sukhumvit Road, Patpong, and RCA. Sukhumvit Road is by far the largest area, and it contains a bunch of mini-districts with bars, clubs, and karaoke. Nana is my favorite area because of its variety of international restaurants and beer bars. Patpong is home to Thailand’s go-go bars. Going out here is a true adventure, and there are so many different places to go. Each place has a unique theme and typically puts on a show at some point in the night. If you want to avoid the chaos of Bangkok nightlife, RCA is much nicer and usually draws a calmer crowd. No matter where you go, you are bound to wake up the next morning in awe of the wild night you just had. 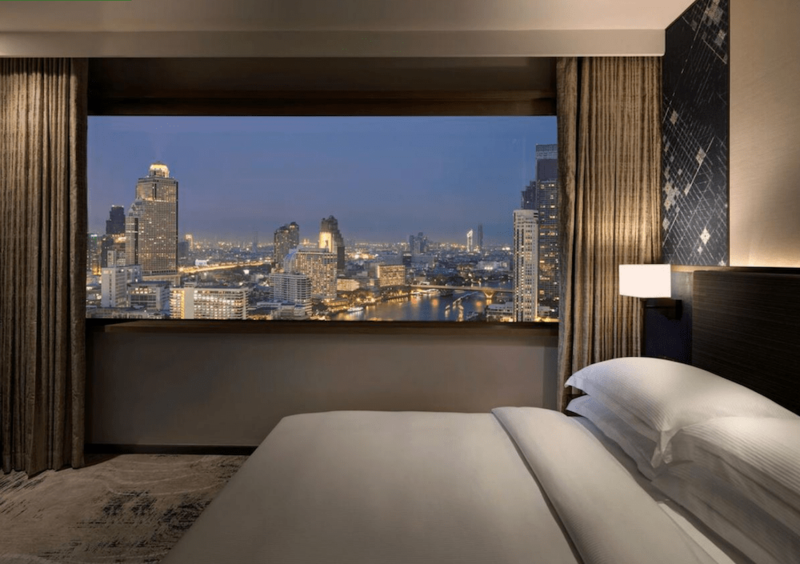 Finding accommodation in Bangkok is easy, and you are guaranteed to find something that fits your budget and comfort level. If you’re backpacking or travelling solo, staying at a hostel near Khao San Road is a great way to meet people. The only downside to staying here is that getting to other parts of the city can take forever. Sukhumvit and Siam are more upscale areas that are perfect for travelers who are willing to spend more on accommodation. If shopping is your thing, go with Siam. 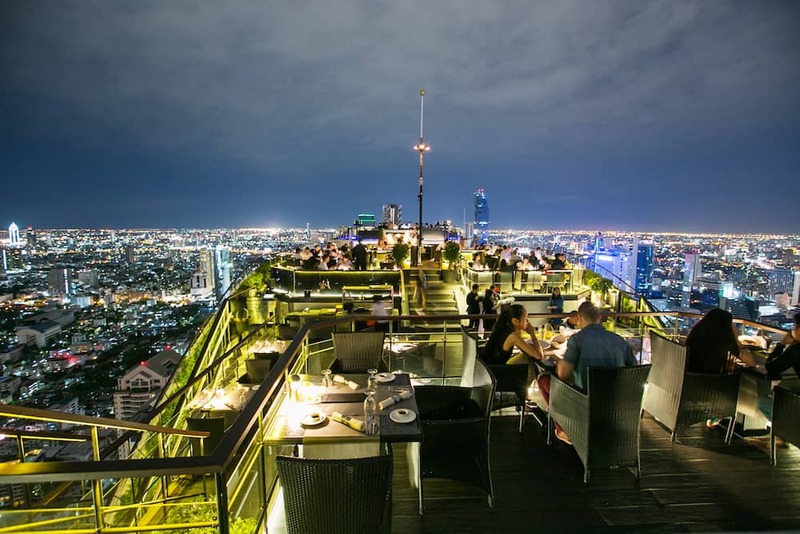 If nightlife is your thing, Sukhumvit would be a better fit. 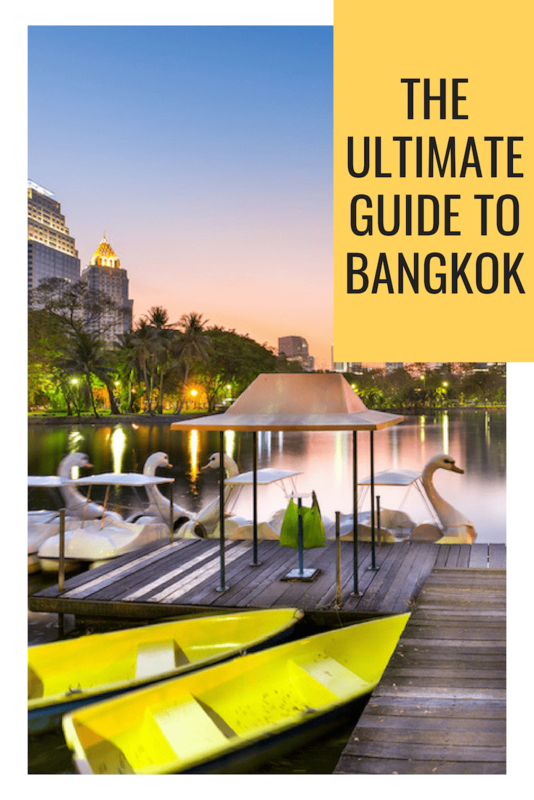 We have also written an extensive guide on Where to Stay in Bangkok. 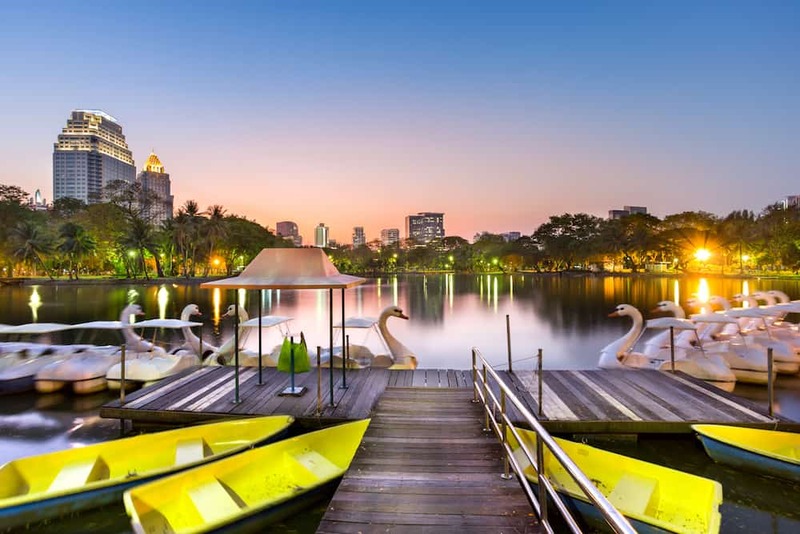 When you need an escape from the hectic Bangkok streets, head on over to Lumpini Park. This park is very easy to access via public transportation, and once you arrive, you can rent a mat for 50 baht and chill out. It’s also a good place to get in some exercise. There are also iguanas roaming around the park, which can be a cool site to see. Chatuchak is another park in Bangkok. I recommend visiting this park after going to the Chatuchak weekend market. Trust me, you’ll want some peace and serenity after spending the morning haggling at the market. I have a love/hate relationship with Bangkok. Every time I feel like if I’ve had enough of its chaos, I find a new noodle shop that I want to become a regular at. This city has so much to offer, but what it offers more than any other city I’ve visited is character. 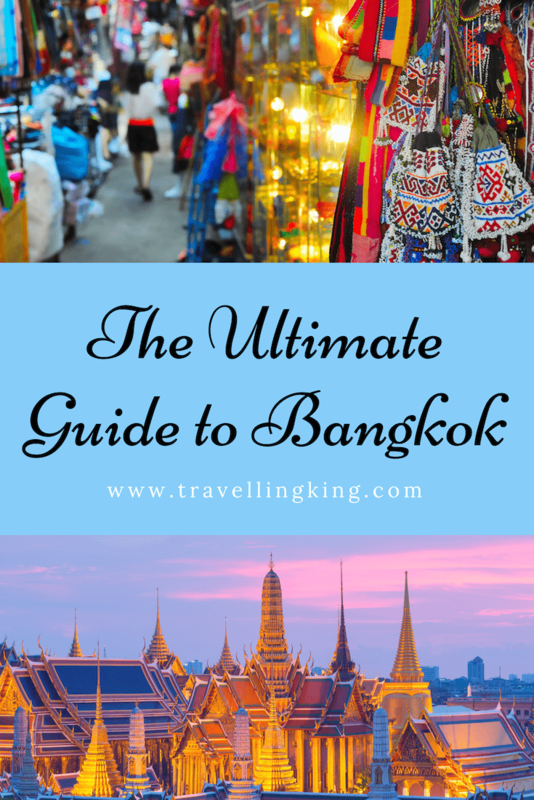 Bangkok is the one city in Southeast Asia that you cannot miss. Trust me.